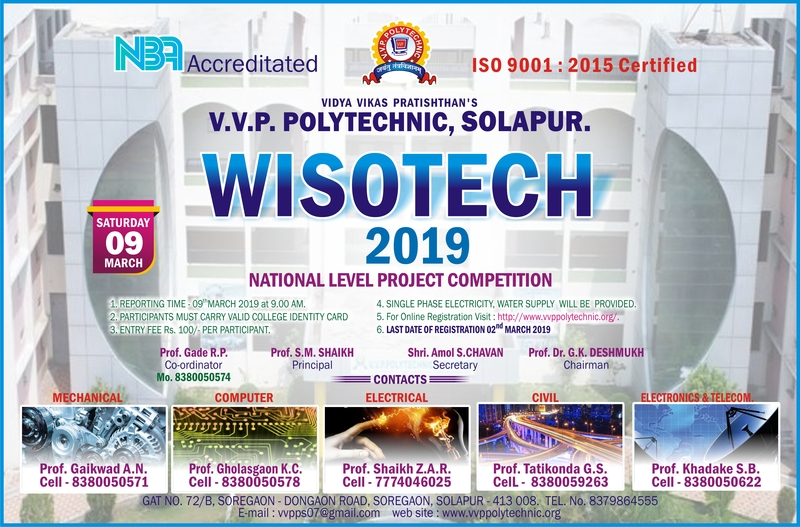 National Level Technical Symposium "WISOTECH-2019"
The Vidya Vikas Pratishthan, Solapur has been founded by 08 highly eminent personalities who are Technocrats, Bureaucrats, and Enterpreneneurs. All of them have varied experience in various fields. They joined their hands and founded this trust, with a broad vision to transform the society through education and to serve for welfare of the people. Our college was established in 2007.we have made astonishing progress in terms of recruiting staff and with student’s results. © 2018 VVP Polytechnic. All Rights Reserved.